"ଓଡ଼ିଶା". ଉଇକିପିଡ଼ିଆ (in Odia). 2007-10-15. Retrieved 2019-03-18. 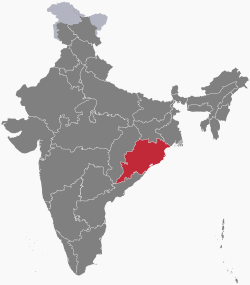 "Odisha". Wikipedia. 2003-06-21. Retrieved 2019-03-18. ↑ "Cities having population 1 lakh and above, Census 2011" (PDF). Government of India. Retrieved 2 ᱯᱷᱮᱵᱽᱨᱩᱣᱟᱨᱤ 2015. ↑ "Ganeshi Lal sworn in as new governor of Odisha". Business Standard. Press Trust of India. 29 ᱢᱮ 2018. ↑ "Our Parliament" (PDF). Lok Sabha. Government of India. Archived from the original (PDF) on 3 ᱯᱷᱮᱵᱽᱨᱩᱣᱟᱨᱤ 2015. Retrieved 2 ᱯᱷᱮᱵᱽᱨᱩᱣᱟᱨᱤ 2015. ↑ "Sub-national HDI - Area Database". Global Data Lab (in English). Institute for Management Research, Radboud University. Retrieved 25 ᱥᱮᱯᱴᱮᱢᱵᱚᱨ 2018. ↑ "State of Literacy" (PDF). Census of India. p. 110. Retrieved 5 ᱟᱜᱚᱥᱴ 2015. ↑ "Report of the Commissioner for linguistic minorities: 47th report (July 2008 to June 2010)" (PDF). Commissioner for Linguistic Minorities, Ministry of Minority Affairs, Government of India. pp. 122–126. Archived from the original (PDF) on 13 ᱢᱮ 2012. Retrieved 16 ᱯᱷᱮᱵᱽᱨᱩᱣᱟᱨᱤ 2012. ↑ "Orissa becomes 'Odisha', Oriya is 'Odia' - Economic Times". Articles.economictimes.indiatimes.com. 2011-09-06. Retrieved 2011-10-29.